Msgr. Michael Souckar, pastor of St. Andrew Church in Coral Springs, preached the following reflection during “An Evening of Prayer, Petition and Healing” for the victims of the shooting at Marjory Stoneman Douglas High School in neighboring Parkland — and for all those in the parish and wider community, especially the teenagers, affected by the tragedy. The service, which was not open to the media, took place Sunday evening, Feb. 18, 2018. Why are we here tonight? First of all, we are here as people of faith. God is relevant in our lives and faith is not something we merely practice in this church or leave at the door when we enter our homes, work places or schools. We are here to turn to God in our hearts for God first turned toward us in his only Son, Jesus Christ. This faith gives us hope. In Jesus, God fully identified with us in our human condition. By becoming a human being in all things — except sin — God in his son Jesus has fully identified with us; with our weakness, our frailty, our woundedness, our vulnerability. In the crucifixion, God in Jesus is no mere spectator of human suffering and injustice; God has become a victim of our violence. God did not merely watch Jesus be mocked, scourged, nailed to a tree and killed in the slow agony of crucifixion. No, like a lamb led to the slaughter, he opened not his mouth. On him was placed the sins of us all; by his stripes, we were healed. No longer can we say that God does not know our suffering. God is our companion in every human suffering, including the horrific suffering inflicted last Wednesday afternoon. Therefore, we have hope for we are not alone, God is with us. 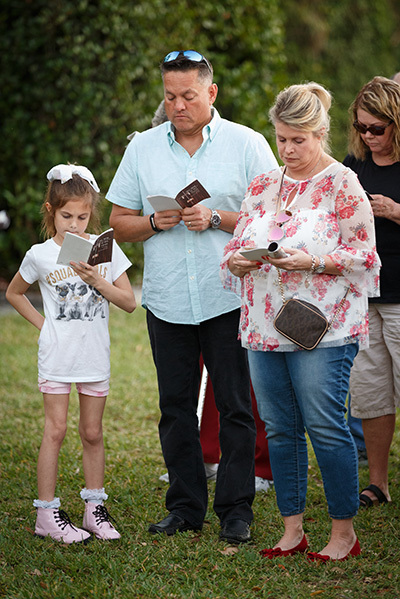 Members of Mary Help of Christians Parish in Parkland, join in a Friday Lenten Stations of the Cross service on Feb. 16 dedicated to the victims and survivors of the deadly Feb. 14 shooting at nearby Marjory Stoneman Douglas High School which resulted in 17 student and faculty fatalities. At least one member of the parish was among the deceased, according to the parish administrator. We also have hope because of the resurrection of Jesus from the dead. By his resurrection, Jesus Christ has overcome sin and death. His resurrection is our rising to new life, if we but believe in him and find new life in the waters of baptism. Therefore, we are here tonight firstly for prayer, to be in communion with God, to pour out our sorrow and to be reminded that God has not, nor will he ever, abandon us. No, he walks with us on this terrible road of suffering, side by side, arm in arm. Secondly, we are here for petition. We are here to pour out our sorrow, our anger, our questions, and our confusion to God. We plead for God to listen to our prayers. We beseech God that we all might turn our hearts and lives back to him and the Gospel of Life. We humbly acknowledge our own personal failures and those of our society which have contributed to so many offenses against the dignity of human life, including innocent students at school. We beg God to be merciful to us in our loss, to heal our wounds and to forgive our offenses. We are not alone in these petitions. As you may already know, our Holy Father Pope Francis has expressed to Archbishop (Thomas) Wenski his condolences and prayerful solidarity with all of us. I personally have heard from Archbishop Wenski, Archbishop (John) Favalora, Bishop (John) Noonan (who dealt with a similar mass killing in Orlando), and many brother priests; all expressing their prayers for all those affected by this terrible event. The Catholic family shares with us our grief and our hope. We are also grateful for the presence of Governor (Rick) Scott and (Coral Springs Vice Mayor Dan) Daley with us this evening. Late this week, I traveled briefly to Washington, D.C. It is always inspiring to see the Capitol, the White House and all the national memorials and monuments. However, this time I was profoundly struck to see the flag flying at half-mast at all these places of our national identity and to realize that this was because of what happened here. How terribly poignant and deeply moving it was to see this iconic image of national mourning, for us. It told me that we are not alone, that the entire nation is mourning with us and in solidarity with the community of Marjory Stoneman Douglas High School, with the communities of Coral Springs and Parkland. Our fellow citizens — of a variety of faiths — are also turning to God with us and for us. Finally, we are here for healing. Several people here tonight were at Marjory Stoneman Douglas High School as the shooting took place. They experienced the shock that what had previously only happened elsewhere was happening in their school. They feared for their safety and their very survival. They thought of their parents and siblings, their fellow classmates and schoolmates, their fellow athletes, musicians; they thought of their girlfriends and boyfriends. They experienced the trauma of indiscriminate violence as gunshots rang out in their classrooms and hallways. They took shelter under desks and in closets, guided by brave and courageous teachers, janitors and administrators who themselves were targets. The students, faculty and staff of Marjory Stoneman Douglas High School need healing and that healing includes the merciful and compassionate touch of Jesus Christ. Likewise, parents, siblings and friends of these students experienced shock, disbelief, total fear of the worst, the agony of separation and finally the loving embrace of reunion. These family members and friends need healing; a healing of emotions and spirit that only the God who raised Jesus from the dead can provide. All of us in Coral Springs and Parkland and even the entire nation need healing. Our disbelief that yet another school shooting has taken and wounded innocent lives has wounded us. We grieve with all those who mourn the loss of a loved one. We grieve that someone from our own community would choose to commit such a violent and heartless action. We are angry that this sort of thing has “happened again” and that we as a society have not done enough to keep our children safe. The anger is real. But anger is most often a symptom of hurt. In any situation, and especially in this one, each of us must find ways to convert our anger into righteous action that promotes true justice and lasting peace. We must also allow the Lord to heal the hurt which is the source of this anger. In a few minutes we will pray the Litany of the Most Sacred Heart of Jesus. I believe this litany sums up and represents the three reasons we are here. First of all, we turn to Jesus, the Second Person of the Blessed Trinity, our Lord and Savior. The Heart of Jesus is the fountain of compassion, of mercy and forgiveness. His heart was moved with pity for the widow of Nain as she was burying her only son; he raised that young boy from the dead and gave him back to his mother. His own heart was pierced by the soldier’s lance as he hung dead upon the cross. Water and blood flowed out, representing baptism by which our sins are washed away and the Eucharist by which we are spiritually fed. That same heart is the source of our healing, renewal and daily strength to continue on, forever changed but firm in faith. I dare say that the Sacred Heart of Jesus was again wounded on Wednesday of last week, Ash Wednesday, around three o’clock in afternoon, the hour of his passion and death. No, we are not alone. God knows our suffering because in Jesus he suffered for us. Just as the Risen Christ bore the wounds of his passion — he showed them to Thomas to end his doubt — so the Sacred Heart of the Risen Jesus still carries the wounds of his passion, lest we ever forget that God loves us to the end, and nothing can extinguish that love. May the Sacred Heart of Jesus have mercy on us. Heart of Jesus, delight of all saints, have mercy on us. What does the Church say about gun control?